Here are my suggestions to you, my friends, to add to your barbeques, fireworks, and drinking this Fourth of July week. “The Fashion Show” exhibition at Peter Fetterman Gallery. Photo by Edward Goldman. On the way to the beach, I would suggest you stop in Santa Monica at Bergamot Station and check out two exhibitions. 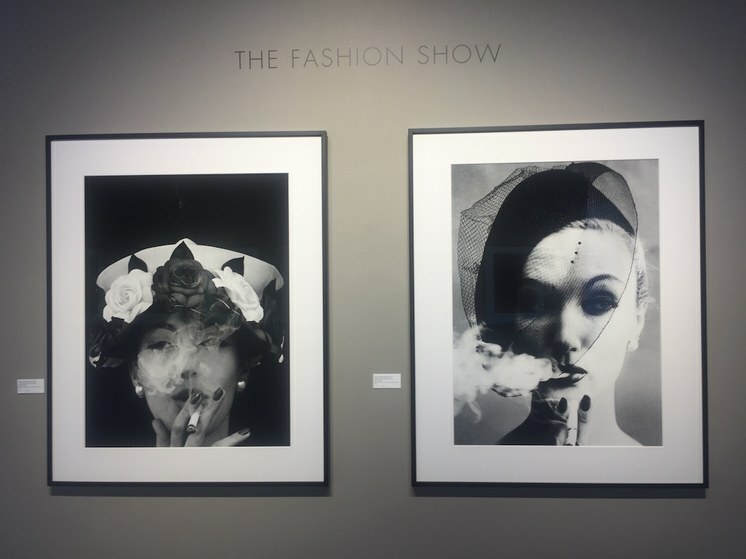 The first is at Peter Fetterman Gallery where you’ll find a series of amazing photo images of stunning fashion models captured by the most famous photographers of the 20 th century. And how about these two smoking beauties by William Klein. Had anyone thought in the 1950s that smoking could kill you? “New Paintings” exhibition by Dan McCleary at Craig Krull Gallery. Photo by Edward Goldman. Another exhibition to check out is by well-known Los Angeles artist Dan McCleary at Craig Krull Gallery. 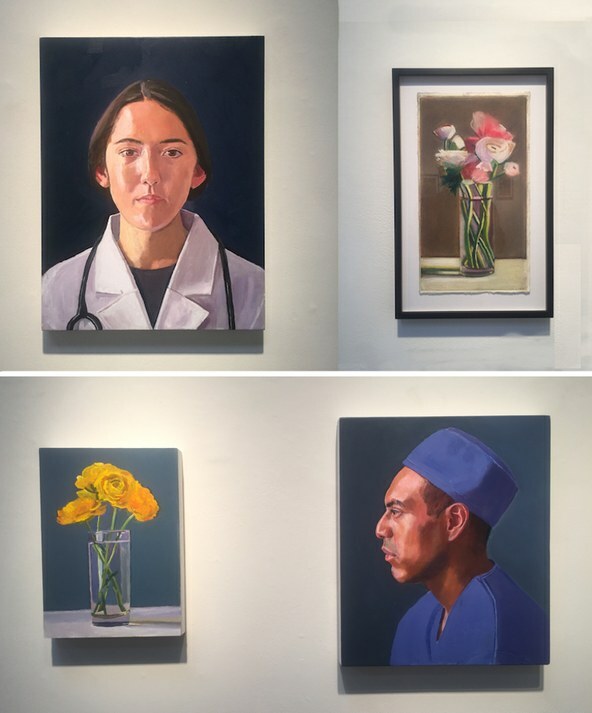 His small-scale still lifes and portraits of people like you and me persuade you to slow down, to think, and to explore the emotional connection developing between the image and yourself. On Saturday, July 7 at 11 a.m., Dan McCleary will be talking about his exhibition with fellow artist John Sonsini. The entrance to the exhibition, “Striking Iron: The Art of African Blacksmiths” at the Fowler Museum at UCLA and Photos by Edward Goldman. And here are a few words about a new, beautifully-installed exhibition, “Striking Iron: The Art of African Blacksmiths” at UCLA’s Fowler Museum. I like to refer to this museum as “the little engine that could.” Every exhibition there makes you think that you are on an elegantly-designed theatre stage with the artists and their artworks showing off their best for you. The dramatic entrance to this exhibition makes you feel the heat as you walk through a “burning” video of fiery coals. This encounter appropriately warms you up for the presentation of beautiful cast-iron sculptures. Clockwise, Elvis Presley meets U.S. President Richard Nixon in the White House Oval Office, December 21, 1970 (Photo by Ollie Atkins); Presley in “Jailhouse Rock,” 1957 (Image via Pixabay); Scene from “The King” film, 2017 (Oscilloscope Laboratories). 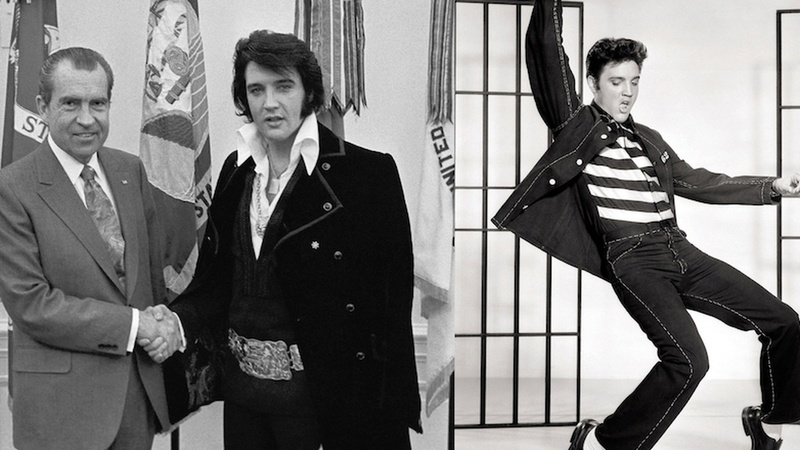 And how about paying homage to the one and only Elvis Presley? “The King” is a new documentary not only about Elvis during his lifetime but also about America in the four decades following his death. 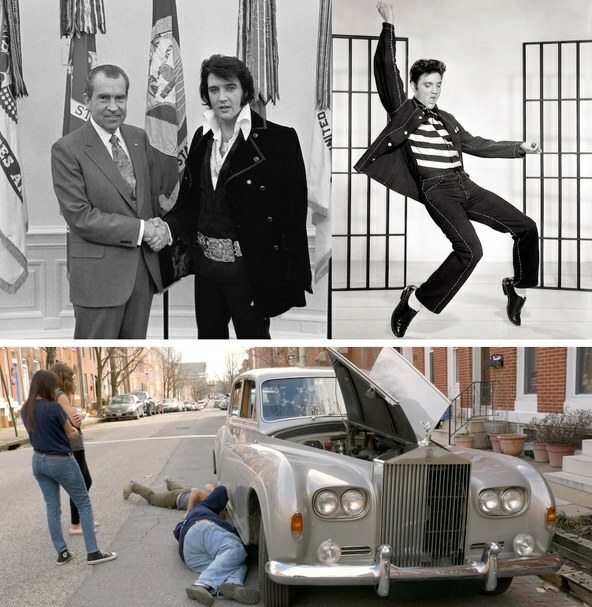 We travel with various characters throughout the country in Elvis’s 1963 silver Rolls Royce. There are moments of joy and moments of sorrow seeing this country boy lose his authenticity while his country experiences the decline of the American Dream. “The King” is playing for only 10 more days at the Nuart Theatre. 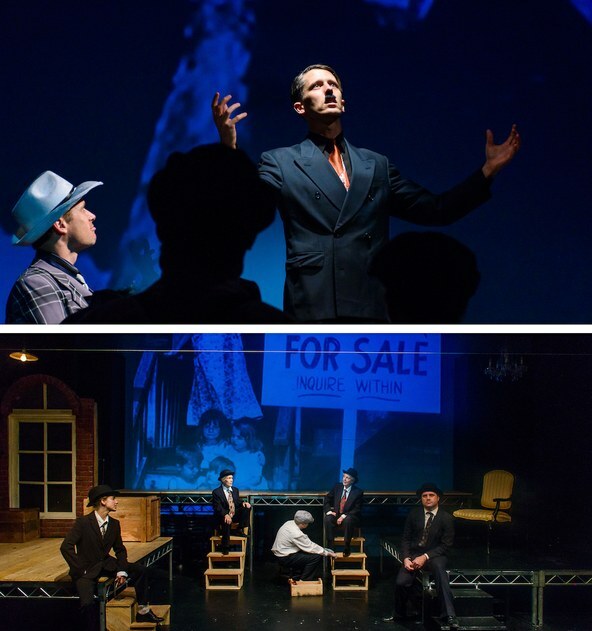 Top: Nathaniel Lynch (left) and Andrew Loviska in “The Resistible Rise of Arturo Ui” by Bertolt Brecht at City Garage. Bottom: From left, Lindsay Sawyer, Sandy Mansson, Griffith Adams, Geraldine Fuentes, Beau Smith in “The Resistible Rise of Arturo Ui” by Bertolt Brecht at City Garage. Photos by Paul M. Rubenstein. The 49-seat City Garage theatre at Bergamot Station presents a very ambitious staging of Bertolt Brecht’s famous play, “The Resistible Rise of Arturo Ui.” The action takes place in Chicago among the crooks and hoodlums, with obvious parallels to the Nazi uprising in Germany. The demagoguery so prevalent in today’s world politics makes this production of “Arturo Ui” particularly timely and relevant. Top: The ensemble cast in the Celebration production of "Cabaret" at Celebration at the Lex Theatre. 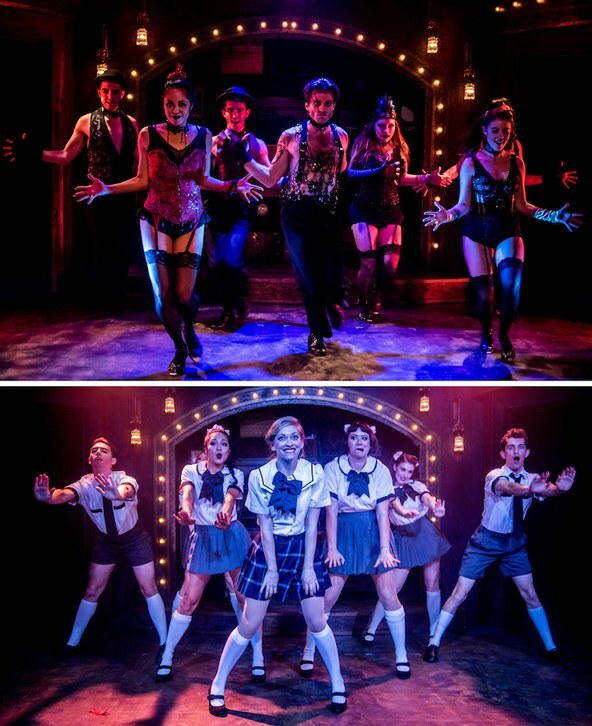 Bottom: Talisa Friedman, center, as Sally Bowles with the nightclub performers of "Cabaret" at Celebration at the Lex Theatre. Photos by Matthew Brian Denman. Speaking of Nazi Germany, welcome to the Kit Kat Klub in Berlin—you know the one from “Cabaret” with Liza Minelli. Here, at Celebration Theatre in West Hollywood, the whole theatre is transformed into a nightclub, where members of the audience share the stage with dancers and singers, sometimes dressed but mostly undressed. The staging and acting is simply superb. Top: Sarah Steele (left) and Cassie Beck in “The Humans” at the Ahmanson Theatre. Photo by Brigitte Lacombe. 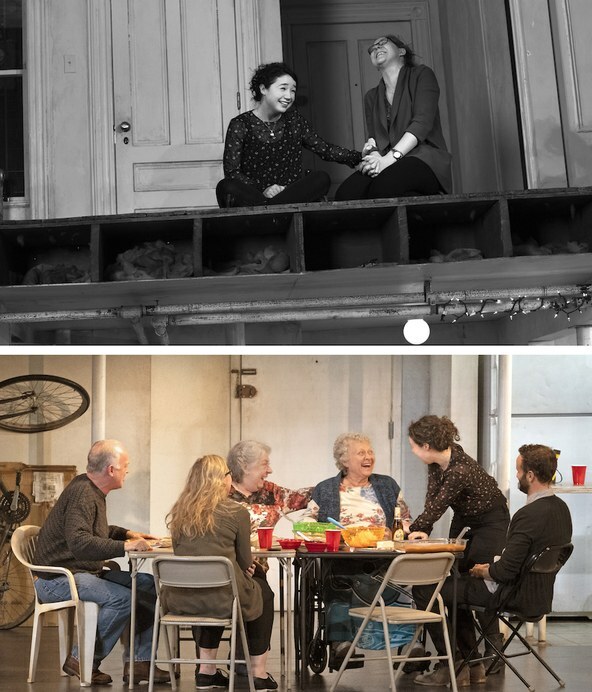 Bottom: From left, Reed Birney, Cassie Beck, Jayne Houdyshell, Lauren Klein, Sarah Steele and Nick Mills in “The Humans” at the Ahmanson Theatre. Photo by Lawrence K. Ho. And now, back to America, to our time. The Ahmanson Theatre presents “The Humans,” a portrait of a three-generation American family gathering for a holiday filled with laughter and sorrow and everything in between. This is the same Broadway production and cast that won the 2016 Tony Award for Best Play. Trust me, you’ll recognize these people and yourself while watching this production. So, with all this, have a great Fourth of July, my friends.